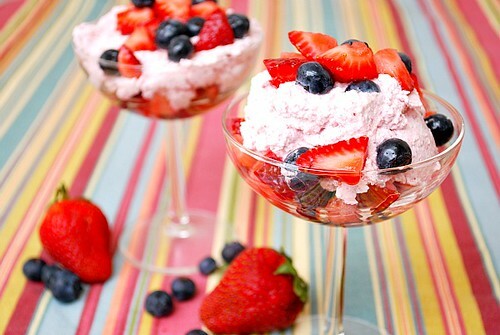 A dessert fool is an English dessert typically made with pureéd fruit, whipped cream and sugar. For this special dessert, you only need 5 ingredients and one key ingredient is COOL WHIP Whipped Topping. For this dessert, I found myself saving a lot of time, money and effort to make something special. Chopped strawberries and fresh blueberries are combined and half of this mixture is pureed and strained until smooth. The puree is gently heated and a touch of gelatin is stirred in to help it set. The remaining berries are tossed in sugar to macerate. Once the pureed mixture has set up, it's carefully folded into COOL WHIP Whipped Topping to create a luscious fruit flavored cream, Before you know it, the macerated berries and fruity COOL WHIP Whipped Topping are layered and served up. Not all desserts require lots of time in the kitchen and this specific recipe is a great example of that. It's quite an elegant dish that's perfect to serve to guests or just enjoy with your family on a regular weeknight. 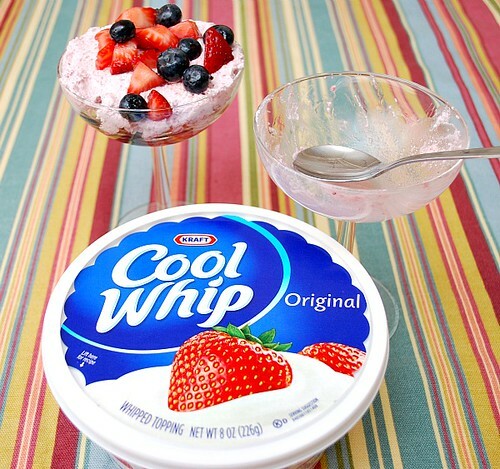 So take advantage of the fresh berries this season and save time with COOL WHIP Whipped Topping with this recipe! COOL WHIP is offering a Fan Dessert of the Month Contest on Facebook The winner each month will win $500! All you have to do is make a COOL WHIP dessert, take a photo, and upload it on Facebook. Good luck to all those that participate! "What you add makes it. #coolwhipmoms"
Process 1 quart strawberries, 1/2 pint blueberries, and 1/2 cup sugar in food processor until mixture is completely smooth, about 1 minute. Strain berry puree through fine-mesh strainer into 4-cup liquid measuring cup (you should have 2 1/2 cups puree; reserve any excess for another use). Transfer 1/2 cup puree to small bowl and sprinkle gelatin over top; stir until gelatin is incorporated and let stand at least 5 minutes. Heat remaining 2 cups puree in small saucepan over medium heat until it begins to bubble, 4 to 6 minutes. Remove pan from heat and stir in gelatin mixture until dissolved. Transfer gelatin-puree mixture to medium bowl, cover with plastic wrap, and refrigerate until cold, about 2 hours. Meanwhile, chop remaining 1 quart strawberries into rough 1/4-inch pieces. Toss strawberries, remaining 1/2 pint blueberries, and 2 tablespoons sugar together in medium bowl. Set aside for 1 hour. Remove thickened berry puree from refrigerator and whisk until smooth. In a large bowl, add the COOL WHIP and slowly add two-thirds of puree; mix until incorporated, about 15 seconds. Using spatula, gently fold in remaining thickened puree, leaving streaks of puree. Transfer uncooked berries to fine-mesh strainer; shake gently to remove any excess juice. Divide two-thirds of berries evenly among 6 serving dishes. 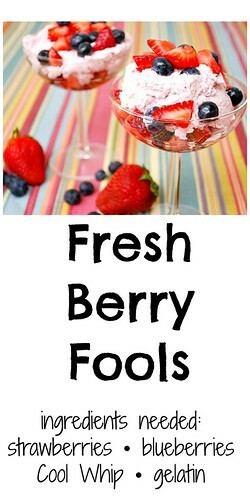 Divide creamy berry mixture evenly among glasses, followed by remaining uncooked berries. Serve immediately. Good luck with your entree... it sounds delicious, reminds me of my Southern baptist church potluck summer lunches. oh my gosh those look SO delicious! fluffy and fabulous! I wish I could grab one through the screen! haha thanks for sharing!